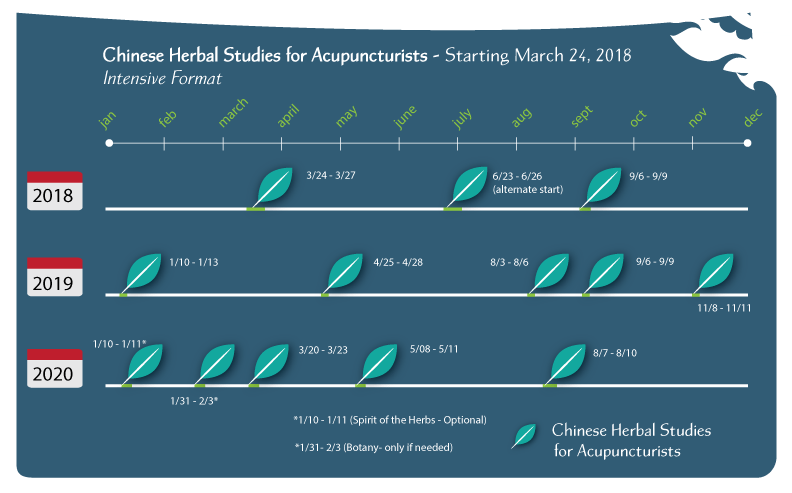 Herbal Studies for Acupuncturists is our Chinese Herbal Studies program offered in a format convenient for recent graduates and licensed practitioners who want to add herbal medicine to their practices. The program schedule allows you to complete the program while living and working outside of the Gainesville area. Included in the well-integrated (495) hours of didactic instruction and (210) hours of clinic training is hands-on experience in an herbal dispensary. Our dispensary includes a full compendium of more than (300) loose herbs, (200) granulated single herbs and prepared herbal formulas (patents). The format for Herbal Studies for Acupuncturists is completely intensive-based. The curriculum is delivered in a total of (12) sessions. Each session is (4) days, typically a long weekend (Thursday – Sunday). The first (5) sessions are spaced 3 to 4 months apart and present the majority of the didactic coursework. This allows sufficient time between sessions for you to assimilate the information and complete direct home study assignments. The next (7) sessions are spaced one to two months apart. These sessions, also (4) days, include your clinical work with patients, practical hands-on experience in the herbal dispensary, as well as didactic course material on internal medicine, Botany and Spirit of the Herbs (optional). Each 4-day session starts at 9 am and ends at 6 p.m., with an hour and twenty minute break for lunch. In between sessions, classroom learning is reinforced and furthered through directed study assignments. Students are expected to attend all days of all sessions in order to receive course credit. Attendance is taken daily. If you are interested in adding Chinese herbal medicine to your practice, please read about our Chinese Herbal Studies program to decide which format is the best fit for you. For information about admissions requirements, please read our Admissions Requirements. Tuition and fees are described here. To begin your journey towards becoming a Chinese herbal medicine practitioner, simply fill out the form on right to contact our Admissions counselor. We will contact you promptly.